Chocolate chips, M&Ms, oatmeal, peanut butter, and... love. These are my "signature" cookie. I've adapted the recipe over the years from various recipes I found online and in cookbooks, and if I may say so, they're perfection. The week before our wedding, I made about 5 batches. Each batch makes about 6 dozen cookies...that's a lotta cookies. It took me an entire afternoon, but it was the perfect pre-wedding stress reliever. 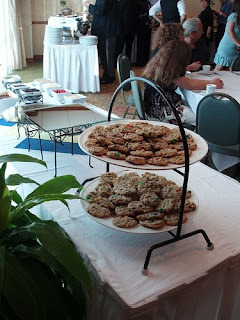 We served them at our intimate rehearsal dinner for 100 instead of a groom's cake. They disappeared in minutes! Makes 6-8 dozen cookies. I recommend halving the recipe, as the large amount of dough can get quite unwieldy in the mixing process. They also freeze well if you have leftovers. Grease cookie sheet(s) or line with aluminum foil. In a very large bowl, cream together margarine, butter, peanut butter, brown sugar, and white sugar until smooth. Beat in eggs and vanilla. In another bowl, combine flour, baking soda, baking powder, salt, and rolled oats. Stir flour mixture into sugar mixture. Stir in chocolate chips and M&Ms. Drop by tablespoonfuls onto prepared cookie sheets. Bake 9-10 minutes or until edges are golden. Enjoy! Do you use non-instant oats? Did you keep finding the cookies all over the house for ages? I'm totally laughing about the cookie-hiding. We had a dog that used to steal and hide potatoes. @Wendy Haha! Just plain rolled oats, I'm sure you can get them in bulk at Weggies! And yes, they were in the half bath and under couch cushions. I bet my kids would LOVE this - 6 dozen!! !